I'm a little out of the loop. What is generally considered the better panorama stitching software? I have PS CS5, but I've never been fully satisfied with the results. Always seems hit-and-miss. I've had very good results from Microsoft's Image Composite Editor, and you can't beat the price of free. Main downside is that it is (unsuprisingly) only available for Windows. Ian Riches - Bedford, UK. PTGUI is my go to. Post edited over 1 year ago by kjonnnn. ICE for me. Quick and simple. This is a 50 image stitch with a 50mm. I like that ICE lets you preview the method before you commit to which one you prefer. Post edited over 1 year ago by inkista. Well worth the license price over Hugin for the masking which saves me from hours of dinking with masks/layers in Ps to erase ghosts/clones. And the viewpoint correction feature makes tripod erasure at the nadir dead easy. But. 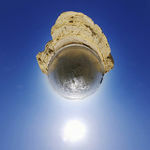 I tend to shoot 360x180 equirectangulars with a fisheye lens. YMMV. In reality, if you make it easy for the application to work out the join points by shooting with enough overlap and similar enough perspective, almost anything should work fine. My second attempt with CS6. Like stated you need good overlaps.